Ed SchieffelinTombstone was founded in 1877 by a prospector named Ed Schieffelin. Ed was staying at what was then called Camp Huachuca (we-chu-ka) as part of a scouting expedition against the Chiricahua (chair-i-cow-uh) Apaches. During his time there he would venture out into the wilderness "looking for rocks", all the while ignoring the warnings he received from the soldiers at the camp. They would tell him, "Ed, the only stone you will find out there will be your tombstone". Well, Ed did find his stone. And it was Silver. So, remembering the words of warning from the soldiers, he named his first mine The Tombstone. Tombstone in 1881It wasn't long before word spread about Ed's silver strike. Soon prospectors, cowboys, homesteaders, lawyers, speculators, gunmen and business people flocked to the area in droves. In 1879, a town site was laid out on the nearest level spot to the mines, known at that time as Goose Flats, and was appropriately named "Tombstone" after Ed Schieffelin's first mining claim. Parade down Allen Street in the late 1800'sBy the mid-1880's Tombstone's population had increased to around 7,500. This figure counted only the white male registered voters that were over 21 years of age. If you take into account the women, children, Chinese, Mexicans and the many "ladies of the evening" the estimates are that the population was between 15,000 and 20,000 people. At its peak, it is said to have been the fastest growing city between St. Louis and San Francisco. There were over one hundred saloons, numerous restaurants, a large red-light district, an even larger Chinese population, schools, churches, newspapers, and one of the first public swimming pools in Arizona (which is still used today). Historic Schieffelin HallThere were a few theaters in town, the most famous of them being Schieffelin Hall and the Bird Cage Theatre. Schieffelin Hall was where the "respectable" people in town went for entertainment. It opened in June of 1881 and was built for the people of Tombstone by Ed Schieffelin's Brother Al. It is the largest standing adobe structure in the southwest United States and was built to be used as a theater, recital hall and a meeting place for Tombstone Citizens. Wyatt and Morgan Earp attended a performance there the evening that Morgan was killed by an assassin's bullet. It is still in use today by the city government and civic groups. 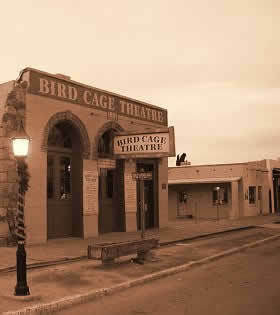 Birdcage TheatreThe Bird Cage Theatre is another story. It was a saloon, theater, gambling hall and brothel. Legend has it that no self-respecting woman in town would even walk on the same side of the street as the Bird Cage Theatre. It opened its doors on Christmas Day 1881 and ran 24 hours a day, seven days a week, 365 days a year until closing its doors in 1889. In 1882, The New York Times reported, "the Bird Cage Theatre is the wildest, wickedest night spot between Basin Street and the Barbary Coast." Evidence of this can still be seen in the 140 supposed bullet holes that have been found in the walls and ceiling. The Bird Cage was named for the cage style crib compartments suspended from the ceiling. It was in these "Bird Cages" that the "ladies of the evening" entertained their customers. The story goes that they were the inspiration for the song, "She's only a bird in a gilded cage", which was quite popular during the early 1900's. After the fire of 1882Two major fires swept through Tombstone during the 1880's. Legend has it that in June of 1881 a cigar ignited a barrel of whiskey at the Arcade Saloon. The subsequent fire destroyed over 60 businesses in the downtown area. But the town rebuilt itself and kept on growing. In May of 1882, another fire ripped through downtown Tombstone destroying a large portion of the business district. Again, the town rebuilt. Welcome to Boothill GraveyardTombstone is also the home of Boothill Graveyard. Boothill began in 1879 and was used until 1884 when the New Tombstone City Cemetery was opened on West Allen Street. 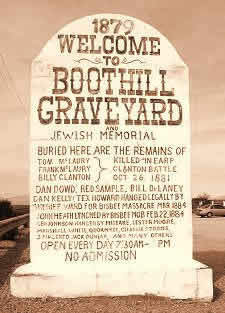 After the opening of the new cemetery, Boothill became known as "The Old Cemetery". The City cemetery is still in use today. Legend has it that Boothill was named for the fact that many residents there died violent or unexpected deaths and were buried with their boots on. However, it was named Boothill after Dodge City's pioneer cemetery in the hopes of attracting tourists in the late 1920's. Many famous Tombstone folks lie there including the victims of the 1881 Shootout on Fremont Street between the Earps and the Cowboys. For many years, it was neglected. The desert overtook parts of it and vandals removed grave markers. Then, in the 1920's concerned citizens began the process of cleaning up the Old Cemetery and researching the placement of the graves to preserve it for future generations (and to make a little money on tourism). 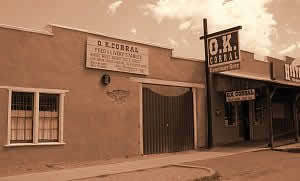 Restored OK Corral SiteThe most famous event in Tombstone's history was the famed Gunfight at the OK Corral, which didn't happen at the corral, but in a vacant lot on Fremont Street. On October 26, 1881, members of the "Cowboys" had a run-in with Wyatt, Virgil and Morgan Earp with help from Wyatt's friend Doc Holliday. 24 seconds and 30 shots later, Billy Clanton, Tom and Frank McLaury were mortally wounded. In many peoples opinion, it was this one event that has kept Tombstone alive for all these years. The 1882 Cochise County CourthouseIn 1882 the Cochise County Courthouse was built at a cost of around $45,000. 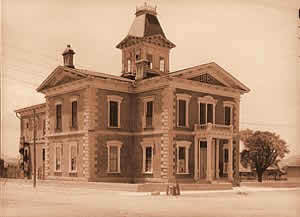 It provided offices for the county sheriff, recorder, treasurer, board of supervisors, and included a well-built jail. The courthouse was a comfortable symbol of law and stability in these turbulent times. The county seat remained in Tombstone until voters in 1929 chose to move it to Bisbee, a bustling copper mining town 29 miles away. The last county office left the courthouse in 1931. Budget cuts in 2010 by Gov. Jan Brewer almost forced the Museums closure. Luckily the Tombstone Chamber of Commerce stepped in and met the demands from the state to take over operation of the museum. Abandoned buildings on Allen Street in the 1940'sAs the silver mining continued the mineshafts were dug deeper and deeper to get the precious ore. Once they hit the 520-foot level, the water table was reached which flooded the mines. Attempts to pump out the water marginally worked for a few years but soon became too costly to continue. 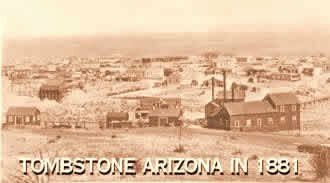 As the mining slowed down, the people of Tombstone started leaving, but not before $37,000,000 worth of ore had been taken from the many mines in the area. It is estimated that by the early 1930's Tombstone's population dwindled to around 150 people.